Please test the following tests on both the Boost and Clean theme. Please also test these on each of the supported browsers. Create 2 courses, c1, c2 and c3. Enrol yourself in all 3 courses. Navigate to Site Administration > Courses > Course default settings. Confirm the setting "Show course images" is enabled. Navigate to your dashboard and look at the course card image for c1. Click on the link for course c1. Confirm the image shown in the course header for c1 matches the course card image for course c1 on the dashboard. Click the gear icon in the course header. Upload an image in the course summary files section. Confirm you see your uploaded image in the course header. Disable setting "Show course images". Confirm no image is shown in the course header. Boost and Clean themes Please test the following tests on both the Boost and Clean theme. Please also test these on each of the supported browsers . Setup Users and enrolments Log in as admin. Create 2 courses, c1, c2 and c3. Enrol yourself in all 3 courses. Check if course images are enabled Navigate to Site Administration > Courses > Course default settings. Confirm the setting "Show course images" is enabled. 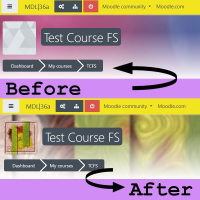 Check if course images match dashboard images Navigate to your dashboard and look at the course card image for c1. Click on the link for course c1. Confirm the image shown in the course header for c1 matches the course card image for course c1 on the dashboard. Add a custom image Navigate to course c1. Click the gear icon in the course header. Select Edit Settings. Upload an image in the course summary files section. Click the Save and Display button. Confirm you see your uploaded image in the course header. Disable course header images Navigate to Site Administration > Courses > Course default settings. Disable setting "Show course images". Navigate to course c1. Confirm no image is shown in the course header. Please note: This improvement is being removed from 3.6 in MDL-63836. Core and the mobile app should display the course image in the same location. Currently the course image only displays on the course card, but not when you're on the course page.